WASHINGTON — President Donald Trump huddled with top advisers at the Pentagon Thursday for a national security briefing that included the ongoing fight against ISIS. The over two-hour long meeting in a secure room called "The Tank" was expected to cover the "state of the world" in broad strokes, a senior administration official told NBC News earlier. Trump was joined by Vice President Mike Pence, Treasury Secretary Steven Mnuchin, Secretary of State Rex Tillerson, Defense Secretary James Mattis, and Chairman of the Joint Chiefs General Joseph Dunford. Asked if he was planning on sending more troops to Afghanistan, President Trump said "we'll see," adding a short assessment that "we're doing very well against ISIS. ISIS is falling fast. Very fast," before heading into the Pentagon. After the meeting — which he deemed "absolutely great" — Trump was vague about if any decisions had been made on Afghanistan. "You'll be hearing," he said without elaborating. Pentagon spokesperson Dana White told reporters after the meeting it was "never meant to be a decision meeting," instead it encompassed global challenges. "They covered the planet: What are the challenges? What are the opportunities?....Literally, they went around the world," she said. An Afghan troop level decision is not anticipated this week. In May, Trump promised a still-undelivered press conference about "how well we're doing" in the fight against ISIS. Though the president repeatedly teased the presser "in about two weeks," that timeline is long gone and the White House reiterated Thursday it had nothing to announce on the event. The President has been weighing a troop surge in Afghanistan, with a military official telling NBC News in May that the administration is considering sending as many as 5,000 more troops into the fight. Trump has given Mattis authority to set troop levels in Afghanistan, Iraq, and Syria. But continued American involvement in Middle East conflicts is Trump himself has been critical of, as a candidate lamenting the state of Middle East affairs and the United States role in the region. "I always say if our presidents had just gone to the beach - and just gone to the beach and not done anything - we'd be in better shape," Trump said in a June 2016 interview with FOX's Judge Jeanine Pirro, saying the world is a mess and U.S. policy helped make it that way. Trump's Pentagon trip comes one day after he told the New York Times he wouldn't have hired Attorney General Jeff Sessions if he'd known Sessions was going to recuse himself from ongoing Russia investigations. 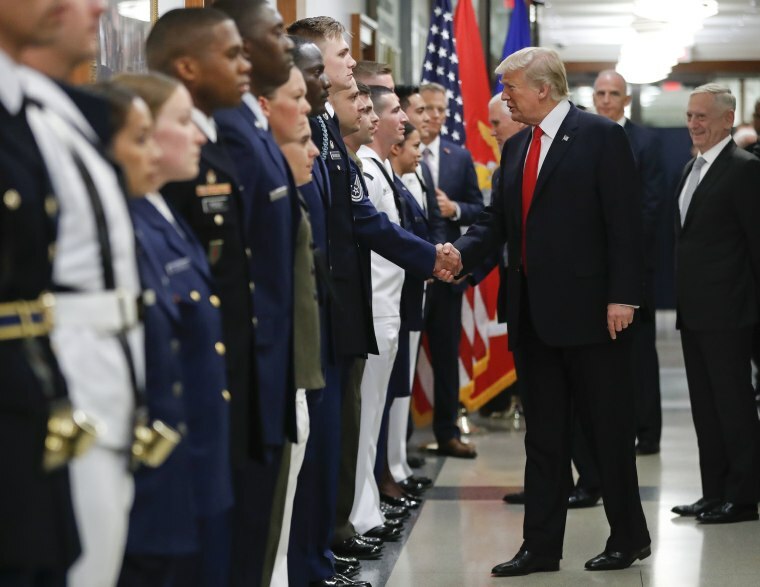 He ignored questions about Sessions as he left the Pentagon, shaking hands with uniformed service members who lined the hallway for his departure. Sessions said Thursday he has no plans to resign his post and will continue on as Attorney General "as long as that is appropriate."